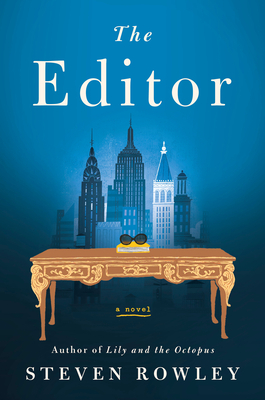 THE EDITOR opens with a nervous meeting between debut novelist James Smale and a potential editor who turns out to be none other than Jacqueline Kennedy Onassis. Rowley perfectly captures the charm and grace of this American icon while portraying her in the role of devoted editor completely invested in helping her author find his true story. In turn, Smale’s journey to confront his past and repair his relationship with his mother resonates on a personal level with Onassis’s most personal role as a mother. This is the first book in a very long time that kept me reading far past my bedtime! Rowley perfectly aligns these two characters’ stories, creating a heartwarming story perfect for readers who appreciate a powerful family story with a touch of history and intrigue. From the bestselling author of Lily and the Octopus comes a novel about a struggling writer who gets his big break, with a little help from the most famous woman in America. After years of trying to make it as a writer in 1990s New York City, James Smale finally sells his novel to an editor at a major publishing house: none other than Jacqueline Kennedy Onassis. Jackie--or Mrs. Onassis, as she's known in the office--has fallen in love with James's candidly autobiographical novel, one that exposes his own dysfunctional family. But when the book's forthcoming publication threatens to unravel already fragile relationships, both within his family and with his partner, James finds that he can't bring himself to finish the manuscript. From the bestselling author of Lily and the Octopus comes a funny, poignant, and highly original novel about an author whose relationship with his very famous book editor will change him forever--both as a writer and a son. Steven Rowley is the bestselling author of Lily and the Octopus, which has been translated into nineteen languages. He has worked as a freelance writer, newspaper columnist, and screenwriter. Originally from Portland, Maine, Rowley is a graduate of Emerson College. He currently resides in Los Angeles.